Is zoom, zoom what you think of when someone says Mazda? The Mazda is a Japanese car manufacturer that started like many others a long time ago, but not as an automaker. Originally the company was known as the Toyo Cork Koygo Company, which was formed in 1920 by Jujiro Matsuda. In 1927 the shortened the name to Toyo Koygo Company LTD. 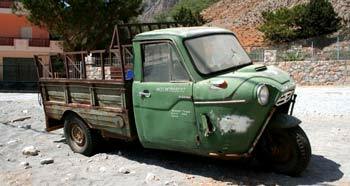 The original vehicle built by the company was a three-wheel truck called a Mazda in 1931. I would sure like to have some Mazda brochures or sales literature that cover that vehicle. The name Mazda actually came from a mythical god of good and light. There were plans to create passenger vehicle next, but everything changed when the company was called on to produce weapons for the war. Mazda turned its efforts back to building automobiles and in 1960 introduced the Mazda R360 coupe and only a couple of years later the introduced the Mazda Carol in 1962. Sorry no Mazda brochures or sales sheets of the R360 or Carol, but we do have some photographs. Mazda continued to forge ahead and in the 1960s formed a limited partnership with Wankel and NSU (a German Engineering firm) to build a rotary engine, which was unheard of at the time and Mazda was to only automaker to boast about have a Rotary engine, gasoline engine and diesel engine. 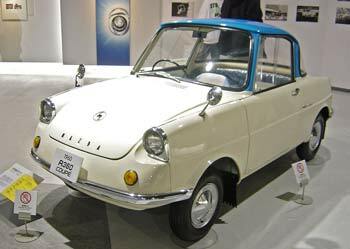 Mazda started building the B1500 pick-up truck in 1965 with a rotary engine and started exporting this vehicle to the United States market in 1971. We do have great selection of Mazda brochures that included the Mazda small trucks. Mazda also built a small sports car know as the 110S Cosmo Sport also powered by the Mazda/Wankel rotary engine. The rotary engine made a big splash in the U.S., but you don’t hear much about it today. 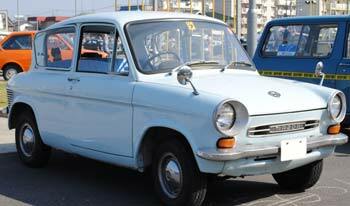 The Mazda B1550 opened the door for this Japanese automaker and soon Mazda was selling small sporty cars with the 12A rotary engine that included models like the RX-2, RX-3, RX-4 and RX-7 all through the 1970s. Unfortunately in Mazda had some financial problems in the late 1970s and in 1979 Ford purchased 25% of Mazda. We are still working on finding some Mazda brochures and sales literature from this era. Things’ started looking up for Mazda and in the 1980s the name was officially changed to Mazda. Mazda was the name of the vehicles but it was never the company name until 1984. Mazda launched several vehicles that were great sellers in the 1980s like the 323 and the 626. Then in 1990 Mazda hit the target with the introduction of the Mazda MXZ-5 Miata, which still remains in the line today. 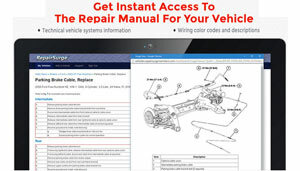 We have many of the Mazda brochures and PDF sales literature of the Miata, which was a very successful vehicle. Mazda was the in the spotlight when the Mazda 787B with a rotary engine won the Le Mans in the early 90s, a first for any Japanese car maker. This is when the auto enthusiasts of the time were singing praises about the Mazda Miata and Mazda RX-7. Mazda was on the top, but that didn’t last very long because Mazda sales started slipping in the American market at the end of the century. However Mazda wasn’t about to take this sitting down and they started expanding and over hauling the line from 2000 and forward. More models, more features and better fuel economy. Mazda focused and fine-tuned their niche with a few new models including the Mazda 2, CX-9, RX-8 and the MazdaSpeed. Fun, sporty, attractive and economical cars at an affordable price were just the ticket for Mazda. Checkout the Mazda brochures and sales booklets below for specifications and a closer look at Mazda yesterday and today.